One of my favorite things about Fall, besides getting new boots, is the decor! 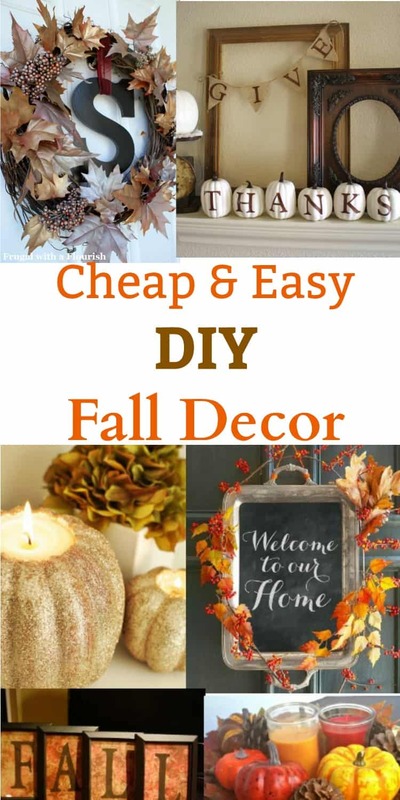 I love trying new DIY Fall Decor ideas every year to add a cozy feel to my porch and inside my home. It really helps set the mood for those cool cozy nights and all of the fun activities that Fall brings. Post contains affiliate links. If you make a purchase, I will earn a small commission at no extra cost to you. 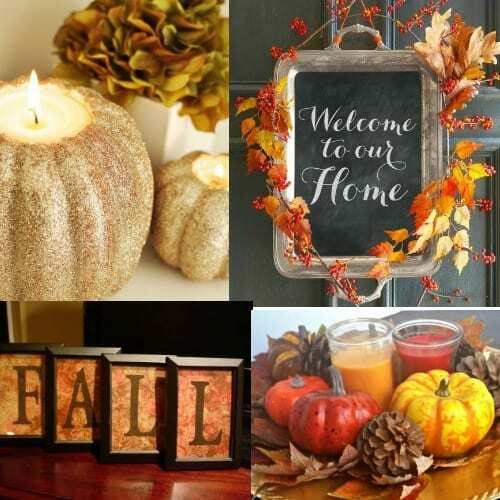 I could buy every Fall decor item that I see in stores like Target and Hobby Lobby but that can get expensive! I like to make decor myself because it saves me a lot of money while still getting the look that I want. I am not crafty at all, so the DIY decor that I do has to be quick and easy. I have a three year old and I just don’t have hours to spend on one single craft project. Pinterest is my go to for getting inspiration for craft and DIY Fall decor projects. I have put together a list of some of my favorite ideas to help give you some inspiration as well. Keep in mind that you don’t have to make it look exactly like they do in the pictures. Change the colors, add a monogram, just give it your own personal spin on it if you want. 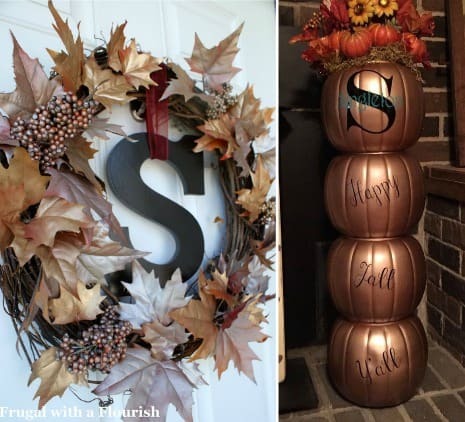 Your friends will be begging to know where you get your unique DIY fall decor! Pumpkin Candle Holders: These are so pretty and would look great on a mantle or side table. Just get some cheap Styrofoam pumpkins and any color of glitter that you want. You can find some drill attachments that are in the tutorial here. Vintage Tray Door Display: If you are tired of the same old Fall wreath on your door, this is a neat alternative. Just use an old tray, autumn branches, and some chalkboard paint to throw this door decor together. You could even buy a tray from the dollar store and spray paint it any color you want. FALL Picture Frames: I love how easy this is to make. You can find some cheap frames at the dollar store. Just grab some stencils and pretty paper to complete the look. Affordable Fall Centerpiece: I put this centerpiece together last year and it cost me less than $8 for everything! I was able to get the platter, candles, pine cones, and pumpkins at the dollar store. 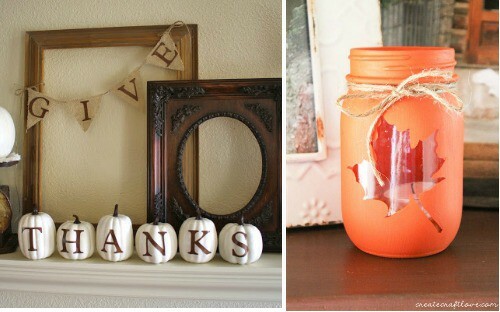 Give Thanks Mantle: This is one of my favorite DIY Fall decor ideas. I can’t wait to make it this year. You can make the pumpkins any color to match the decor already in your home if you want! Mason Jar Fall Luminary: These are so pretty and so easy to make! Make sure to stock up on mason jars for the rest of your Fall and Winter crafts. You could even use letter stencils to spell out “FALL” on the jars. Fall Wreath with Bling: I love how she sprayed the leaves to give it a more elegant look. You can find some monogram letters here to add to your own wreath. Happy Fall Y’all Topiary: Since I live in the South, I am a big fan of this. I love how she turned those ugly dollar store plastic pumpkins into something so pretty for her porch. BOO Halloween Sign: I made this a couple of years ago and I have been using it since. It was so easy to make and I think it turned out great. You can hang it on your front door or just inside your house. 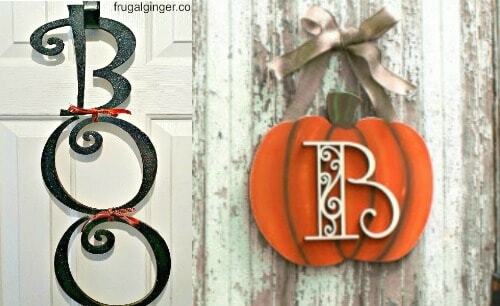 Pumpkin Monogram Wreath: I think this is so cute! It’s great for both Fall and Halloween decor. You can find some wooden pumpkins already cutout here. I love the changing of the seasons and I like that to reflect inside my home as well. 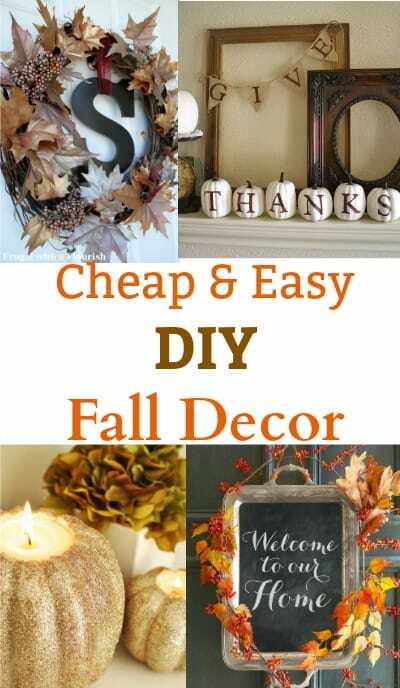 You can constantly change up your decor since these DIY Fall decor ideas are so affordable and easy on the wallet. If you have more DIY Fall decorating ideas, let us know in the comments. Great ideas! I love decorating for autumn it’s one of my favourite seasons. I love decorating with leaves and pumpkins.